There is a lot of uncertainty in the world today. With all the confusion around us one thing is certain – Crime is on the rise. Criminals are finding more ways to enter properties then ever before. Statistics from the the Florida Law Enforcement Agency Uniform Crime Reports show not only a rise in home and business invasion, it also shows one other interesting statistic. Criminals are looking for an easy crime. High percentage of crimes are committed by criminals who have been on the property prior to the crime. 81% of home burglaries occur through the first floor. A high percentage of those are committed on unoccupied home or business. Now imagine if you were home. Shutters will deter most criminals looking for the easy crime. Lets compare this with your alarm system. According to providerofchoice.net “90% of Police believe alarms deter burglary attempts”. Yet these crimes still accure on properties with alarm systems. Even if the alarm works, damage to the property could still accure. Worse yet, your loved ones. Shutters will not only deter a criminal, they will keep your loved ones safe when you are home. No damage will be done a criminal trying to enter if they can’t touch a window or door because you have installed a shutter system that deters them to another property, the easier crime. Concerns with Ultra-Violet Rays penetrating the home through windows and doors is the one thing most don’t think of when purchasing a shutter system. UV rays can cause fading, and eventually be damaging to the interior of your home. Potentially causing thousands to replace the damaged areas. Something you may want to consider when choosing the type of shutter system that’s best for you. This is a nice little perk that most people don’¢t think about when considering a shutter system. Only the Roll-up shutter will truly give you this added bonus in the shutter world. Imagine your home or business able to close out the distractions of the outside world so you may enjoy the comfort of being able to sleep, concentrate, or whatever you would prefer to do without the outside world’s distractions. If deploying your shutter system in a reasonable (small) amount of time is a concern of yours you should address this while considering your shutter system. The Accordion, Bahama, Colonial, and Armor Screen can all be deployed in a reasonable amount of time. The Roll-up, however, is the King of convenience. You may deploy them from the inside unlike the others or with just the press of a button you can deploy them. How’s that for convenience? Another reason to consider shutters for windows and doors is heat transfer. With energy costs on the rise, you could reduce your energy cost as much as 40% with shutters on windows and doors. FPL says “an easy way to reduce your cooling costs is to shade windows and doors from the sun. Keep curtains,blinds and shades closed during the day for the greatest efficiency”. Shutters would stop the sun light from ever entering the room. Doityourself.com says that “There are a number of ways a home loses energy” The primary ways are “Air leakage around doors and windows 35%, Doors and windows (heat transfer from direct sunlight) 20%”. Covering your doors and windows with shutters can greatly reduce this problem. www.eere.energy.gov says “The Energy Efficiency and Renewable Energy Clearinghouse says that roughly 40% of heat build-up and heat loss is through windows and doors inside your home. 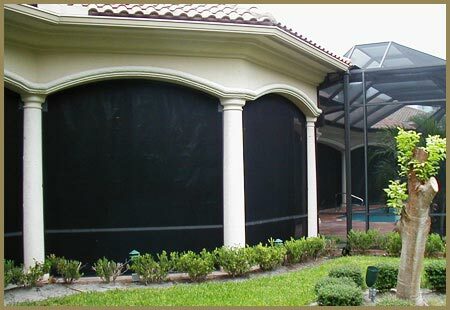 External shading is the most effective home treatment to counter these effects. Shading the exposed windows and doors can reduce temperatures by as much as 20 degrees.” With all this in mind you can see how shutters can help reduce energy costs and help us move forward as we move GREEN into the Future. 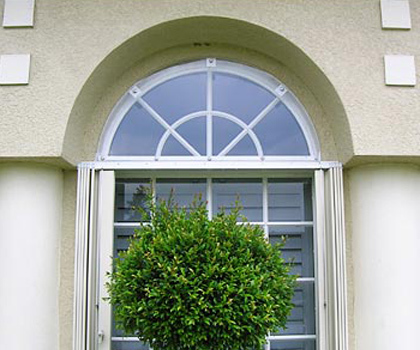 There are few shutter systems that concern themselves with making the Home or business more attractive. However, the bahama and colonial shutters do just that. They can really enhance the style of the architecture of your Home or business. 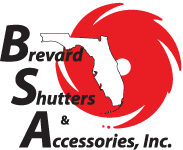 Brevard Shutters & Accessories offers many types of Hurricane Protection. Steel, Aluminum, and Clear Lexan Panels to start, for the budget minded. Accordions and Armor Screen for those looking for a more easily deployed protection. Bahamas and Colonials for those concerned with aesthetics of the home. And finally the Roll-Up Systems for the more educated consumer who is looking for everything a shutter can provide. Just about all shutter systems can give you that easy feeling while you are away from home. Some just may take longer to deploy then others so if this is a concern you should definitely give this some thought. It’s that easy feeling while you are at home that is a little different. Only the Accordion and Roll-up will give you a practical Piece of Mind while you are at home. The simplicity of these shutters will allow you to secure your Home or Business quickly, without an inconvenience.